In one TED talk from 2009, Simon Sinek in his speech How Great Leaders Inspire Action introduced a concept of three golden circles. He argues that whatever we do, we should always start with the Why – why do we do it, what is the inner force driving us? Then he moves onto the How – how do we do it, what is special about us? Only at the end he moves to the What – what we do, what is the end product? For the purpose of this essay, I will define education, the process of acquiring knowledge, as the Why and the How of our lives and knowledge, the product of education, as the What. I will agree with Mr. Skinner’s stance that education is what transcends knowledge over time and give examples discussing this opinion. It is important to start by saying however, that at level of a society, forgetting all that has been learned is a highly theoretical scenario. Knowledge can be compared to building bricks on which our society stands and which act as a foundation for its further advancement. Any society and its institutions have strong interests in preserving their knowledge. These range from banks knowing how much individuals and organizations have deposited with them, through power plant operators being able to produce electricity, to parliaments having records on how many votes each party has. In a short term, knowledge is critical to stability of any society and as such will be carefully guarded. Knowledge also creates an environment for education to take place in. Institutions such as universities collect and disseminate knowledge to allow the current generation to firstly acquire it and subsequently to expand it by building on theories proved by their predecessors. At an institutional level, knowledge is nowadays therefore an important precondition for education to take place. Had it all been forgotten, learning activities of societies would be pure experiments rather than education as we understand it today. This essay will nevertheless that the liberty of thinking about education and knowledge at a level of individuals and will understand knowledge not in its absolute term such as for example knowledge to walk but rather treat it as resource, the What, acquired through a process of education. It will also treat it separately from education itself, which can be better described as a capability, the Why and the How. In philosophy, an ability to ask a good question is valued more highly than knowing its answer. The same can be argued for life. People can forget with time what they studied at school but the ability to learn new things stays with them. This has important consequences throughout their whole life as the following two examples will demonstrate. Firstly, let us look at two societies, one where young people receive lot of education and another one where they receive only little or none at all. People who were faced with big unknowns before and managed to overcome them gain self confidence to do so again even if they have already forgotten what they have originally learned. It becomes a habit for them to face obstacles, to think hard how to crack them and eventually to succeed in removing them. When this author was working in Colombia for Grameen Creative Lab, a part of the Grameen Bank group, he spent a weekend with a poor rural family. When he asked the father what is his life dream, the father replied that he would love to see an ocean at least once in his life. Despite the fact that the ocean was only five hours away from the nearest town, he would probably never see it. He is not used to venturing into the unknown and as nobody else from his village has ever done it either, he does not have the self belief that he would be able to learn how to do it. When working with waste pickers in the slums of Delhi, this author experienced a similar pattern of behaviour. Unlike in developed countries where people are used to learning new things again and again, poor people in the developing world are unable to improve their lives because they lack this crucial ability. Secondly, let us consider two societies with distinctly different styles of education. The United Kingdom, where this author did his undergraduate degree, can serve us one example and China, where this author is working right now, as another. While in the UK, students are encouraged to think critically about what teachers are telling them, in China there is a thousand years old cult of teacher as the ultimate master of knowledge and one that should not be disagreed with. It can be assumed that 20 years after graduation, both British and Chinese students will remember about the same amount of knowledge from their school years, which in most cases is not much. Yet the way they were educated translates into a very flat, low power distance society in the UK and a very hierarchical, high power distance society in China. This example again shows that despite not holding on much of what people learned at school, the What, they way they interact with each other has not been forgotten (the Why and the How). On balance, this essay argues that while at an institutional level, knowledge is critical and if it is forgotten, not even education would survive for it would have nothing to build on, on an individual level, knowledge is less important than education and can transcend it in time. It has shown on the examples of an educated and an uneducated society and a low and high power distance society that even many years after schooling, what it can be safely assumed that most of the knowledge acquired at that time is either forgotten or irrelevant due to scientific progress, education still has a significant impact on people’s lives. 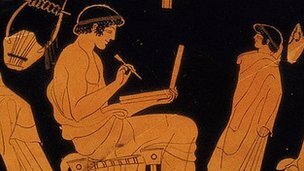 Just saw an interesting article at bbc.co.uk applying teachings of old Greek philosophers to solving Greece’s current problems. What would they say if they lived now? My favourite one is from Archimedes: ‘Finding the solution to a knotty problem requires hard thinking, but the answer often comes only when you switch off – and take a bath’.